← The lotus flower, a perfect analogy of the human condition. Underneath all your thinking there is the stillness of being. I love Paris. I have only been there a handful of times, and a few weeks ago, I took the Eurostar from London to Paris for a short stay. The weather was perfect, a cool breeze softened the summer heat, and I once again fell in love with Paris, with its history, its architecture, and the pure ambience of just being there. I decided I would create an easy visit, and opted out of the long queues of the world famous Louvre and Notre Dame, and instead strolled around the Latin quarter, and along the banks of the Seine. I walked along in awe as I imagined how famous artists, writers, painters, and sculptors would have walked in my very footsteps. Just to think that they were the creators of what makes Paris so dynamic, energetic and lively today. My thoughts were interrupted by the distant sound of an accordian playing a familiar Parisian tune. I stopped for a moment and took a deep breath, almost as if breathing in the soft melody. It was a magical moment. I headed away from the river and up past the Musee d’Orsay, and along the narrow streets up to my most favorite place in Paris, the Musee Rodin. The museum, which used to be the Hotel Biron, sits on about seven acres of beautifully manicured grounds, with rose gardens and a small pond, and scattered about it are magnificent bronze and marble statues created by the most famous 19th century French sculptor, Auguste Rodin. Rodin was born in 1840, and began sculpting when he was 15. He was once accused of having cast one of his statues directly from life. Rodin lived at the Hotel Biron from 1908 until his death in 1917. Rodin donated his entire collection of sculptures to the French State on the condition they turn it into a museum for the public to enjoy, which they did in 1919. There were only a few people ahead of me as I reached the main entrance and I realized then it had been 10 years since I last stood here. I walked quickly as I was waved through. 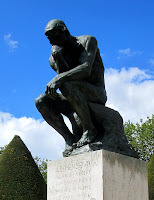 And there he was, just like an old familiar friend, Rodin’s most famous piece, Le Ponseur, The Thinker. I walked around the statue as I contemplated Le Ponseur, a man depicted in sober meditation, possibly battling with a powerful internal struggle as suggested with his tense body twisted from his head down to his curled toes. While his right arm supports his heavy head, his left arm is open. There has been much speculation about what the thinker was actually thinking about. As I walked around the grounds and admiring his other works, I kept coming back to Le Ponseur and just gazed up at him. There was something deeply familiar. I saw myself in him. The mind is everything. What we think we become. Our mind can be clouded by our thoughts. Our thoughts can be destructive and negative. We need to be careful that our mind does not use us, rather that we use our mind. We can disconnect from the thinking mind, by shifting our attention from mind to being, and to being present. All things that truly matter, love, joy, beauty, inner peace, creativity, arise beyond the mind. In the present moment, we can detach from our thinking, to find the stillness underneath, the stillness that is our true self. Le Ponseur serves as a reminder of not to allow our thoughts to consume us. He reminded me of the pain and suffering that life can bring and how powerful our minds are. The way we think about things, is everything. I once again bid farewell to Le Ponseur, and headed back out onto the welcoming streets of Paris, and will make sure it is not another 10 years before I return. I love your insight, Cath! I have always been intrigued by this sculpture but couldn’t explain why. You put my thoughts into words!